Note the extension is "dance", not "com"
Hicks and Chicks Western Square Dance web site is joining with the Central Ohio Council of Dance Clubs web sites. Cued round dancing begins at 7:30 p.m., square dancing begins at 8:00 p.m., and dancing ends at 10:30 p.m. For our regular dances, the cost is $14 per couple, or $7 for singles, and callers and cuers are welcome at no charge. The Hicks and Chicks dance at the Park Ave. Elem. School, 335 Park Ave., Mount Gilead, Ohio. If you do not know what western square dancing is, you are welcome to visit one of our Saturday night square dances and watch, and talk to any officer or member about the square dance activities. Inform the member at the door you are interested to learn what square dancing is about, and they will help you, and, there is not going to be any charge for this visit. Special note about dress: June through September, our dress will be casual. January, February, and March, our dress will be warm casual. The Hicks and Chicks are now listed with the web site www.WheresTheDance.com , with many other square and round dance clubs across the nation. This is very beneficial for a square dancer, who travels away from their home and wants to find a square dance club. The direct link to their “Search” page is: www.WheresTheDance.com/displaySchedules.php. Pictures of the 53rd Ohio State Convention at Columbus, Ohio, 2013, Click here. Square Dance Travel Awards, Click here. Guidelines for H&C Travel Credits, , Click here. The Ultimate in Square Dancing Click here. 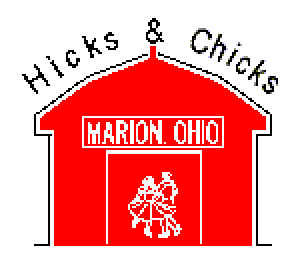 Over the years, the Hicks and Chicks have attended the annual Ohio State Conventions, The Mid-America Jamborees, The Moonbow Weekends, The Atwood Lake and Splendor of Fall Weekends, and many specials of other clubs. Also, during the Summer months, the club participated in the weekly evening dances in Columbus at the Tree Haven Camp Grounds and the Whitehall Community Center. Hicks and Chicks mascot bull- First place at Tiffin.